For 2017 the Chevrolet Trax has received a comprehensive refresh, it is powered by a 1.4-litre engine producing 138 hp and 148 lb-ft of torque. The standard 6-speed automatic transmission is smooth and the Trax performs well in town although highway speeds highlight a need for extra power. Standard equipment is commendable and includes a rear view camera, onboard Wi-Fi and smartphone connectivity. Available extras such as forward collision control and rear park assist enhance safety levels. An accomplished all-rounder, the Trax remains a worthy alternative in the subcompact crossover category. 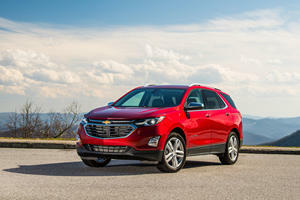 The Chevrolet Trax subcompact crossover has been around for a few years now and receives a refresh for 2017 that adds additional safety and mobile connectivity features. The exterior has been sharpened up as well and this pint sized SUV now looks the part too. Starting with the positive aspects of the interior, the Trax makes the most of its tall profile and both front and rear occupants are well catered for in the head and leg room department. The seats are comfortable too and there is oddments space in the door pockets. There are a few issues however, the quality of some of the materials used is distinctly sub-par, some soft touch surfaces do alleviate the budget feel but even at this low price point there is no excuse for cheap interior trim as others like the Mazda CX-3 and Nissan Rogue Sport do it much better. The small cargo area offers about as much space as you would get in a similar sized sedan although without the vertical loading ability. The seats can also be folded flat to increase the cargo carrying capacity and it is just about on par with other competitors in this segment. The Trax is small and light, this translates into a willing companion on tight urban roads and it is also happy driven in a more spirited manner. The plot unravels a bit at highway speeds where the tall body, short wheelbase and narrow tires conspire against it to induce a fidgety and wandering ride. The standard 16-inch wheels are definitely the ones to stick with as they improve the ride quality but the Trax is best sampled within city confines to take advantage of its small footprint and maneuverability. The Chevrolet Trax is available with a 1.4-liter turbocharged inline-4 engine that produces 138 horsepower and is supplemented with a somewhat more impressive 148 lb-ft of torque. 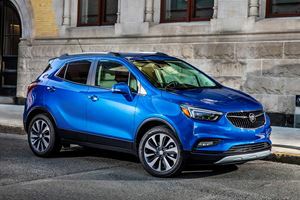 The 0-60 mph time of approximately 10-seconds is about average for this class and the Trax is nippy enough in the confines of an urban setting and the 6-speed automatic transmission is unobtrusive and smooth shifting. When it comes to longer trips though, that fidgety highway ride is also accompanied by a lack of overtaking ability and it is perhaps this need to keep the gas pedal pinned to the floorboards that give the Trax a middling 28 mpg combined estimated fuel consumption figure. Available in three trim options the base LS offering starts off with 16-inch steel wheels, 7-inch touchscreen, Apple CarPlay and Android Auto connectivity, OnStar with on-board Wi-Fi and 6-speaker audio system as well as a rear vision camera, electric windows and power lumbar support for the driver. The LT adds alloy wheels (Alloys are also standard on all all-wheel drive models), cruise control, improved headlights with LED daytime running lights and upgraded upholstery. LT trim also allows for a number of optional extras to be added such as the Driver Confidence (blind-spot monitoring, rear parking sensors) and Convenience (keyless ignition, power driver seat, leatherette upholstery) packages. The top Premier trim adds all of these features as well as 18-inch wheels, heated front seats and leatherette upholstery. The Driver Confidence II package is reserved for the Premier trim and includes forward collision and lane departure warning. Many items can be optioned individually and a sunroof is available as well. 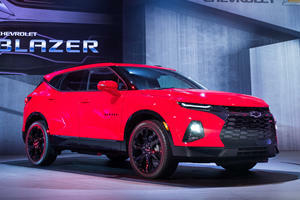 All trim levels can be had in either front or all-wheel drive models, the latter sacrificing some mpg and straight-line performance for the additional grip levels. 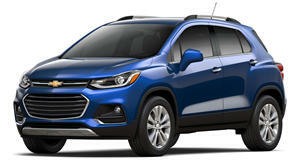 The Chevrolet Trax improves its standing in the subcompact crossover segment with improved features as well as a refreshed exterior design. Passenger space is commendable although highway performance and the quality of interior fittings is not. Standard equipment levels are good and the latest safety features are also available. Nissan was dethroned by one of the Big Three. That's assuming you like the Blazer's looks. General Motors' Asian unit has reached a tentative agreement with labor union representatives on base pay, bonuses.